Horizon 1000107269 Motor Drive Belt. 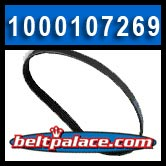 Horizon 1000107269 Motor Drive Belt (Mftr: Bando USA). T100 (TM629C)(2011) Treadmill - Folding. T90 (TM617)(2009) Treadmill - Folding. Replacement Drive Belt for the Horizon 725T. 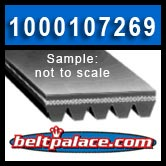 1000107269 TREADMILL BELT IS IN STOCK!